The annual ham radio Field Days for amateur radio operators around the world is happening this weekend. Keep your eyes open this weekend and you may see groups of amateur radio operators in unexpected places. Ham radio operators and their equipment both local and around the world will participated in the annual “Field Days” exercise. While the goals is doomsday disaster preparedness drill, it is also a day for friendship. Ham Radio Field Day 2008 Amateur Radio Operators. Photo by davef3138 from the Crow River Amateur Radio Club Field Day event at the Hutchinson airport. Photo by davef3138 from the Crow River Amateur Radio Club Field Day event at the Hutchinson airport. 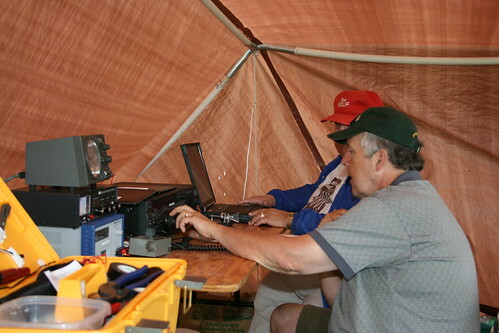 According to the ARRL (Amateur Radio Relay League) Field Day is the largest on-the-air operating event in Amateur Radio with 35,000 participants. Ham operators set up their equipment as if a real emergency had stuck. Working outdoors in tents, makeshift housing or remote locations for 24 hours. We set up antennas on the spot, some using long wire antennas strung between trees. During the contest, participants connect with as many other operators as possible. Some will use voice channels while others use Morse code to contact others. Groups welcome all licensed amateur radio operators to take part. Many clubs encourage the public to stop by and learn more about the hobby. Dwindling membership of the amateur radio hobby is due to high technology computers and cell phones. I earned my first ham Novice license with call sign KB4AAG in 1980. A couple of years later, I changed my call sign to N9GYG upgraded to my current the Extra Class license. To learn more about emergency radio.